Our long-time Senior Minister, Bob Emmert, will retire at the close of 2017. We have been in communication with our congregation about this transition over the past year. 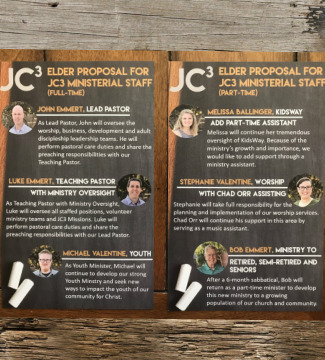 Through prayer and many conversations, our elder's created a vision for our staff that they believe will position JC3 for a continued strong and growing ministry in our area. On September 24, the congregation overwhelmingly approved the elder proposal. READ THE STAFF RESPONSE BY CLICKING HERE. In addition to utilizing current staff members, the plan includes adding an assistant to our vibrant KidsWay ministry and the development of a new ministry to the retired, semi-retired and seniors of our community.